Low-budget. Small. Intimate. Characters. A story about people. This isn't so much a movie as real life. This isn't so much the escapism of the movies as holding a mirror up to life and looking at the reflection of our dreams and aspirations and how sometimes we just have to follow our heart. But in following our heart when it comes to love, can we explain our motivation, our reasoning, or is it merely an inexplicable mystery as to why we do the things we do and why we love the people we love? Margot (Michelle Williams) has been married to Lou (Seth Rogen) for five years. It seems solid. Then again in looking at the day to day life of anyone of us, doesn't it seem solid to the casual observer? Margot meets Daniel (Luke Kirby) and for some inexplicable reason, as with all affairs of the heart, is drawn to him bringing into question what may have appeared solid with her husband Lou. Of course appearances can be deceiving and would Margot have ever been drawn to Daniel if her relationship with her husband was in fact solid? The movie is about Margot's dilemma: "Do I stay or do I go? Is my future with my husband or is my future with this unknown man who just by chance walked into my life?" I couldn't help thinking that sometimes we get bored with what's old and may become enamoured by what's new. Is it love or infatuation? Is it long-lasting or is it some momentary fascination? Long term relationships require a long-term commitment but do we know do we ever know if this one is "the" one and whether the correct choice lies elsewhere? Ah but in writing those words, I can't help thinking of the typical hopeless romantic. That is, the person who is never satisfied, who never truly commits long-term and is always on the lookout for what's around the next corner. Is that indicative of a lack of maturity? Ha! Is it immature to look for love, supposedly true love? Is it a sign of maturity to bite the bullet and remain with the program you've signed up for until death do you part? Somebody, Margot for instance, may counter by saying that we all have but one life; don't waste it. Any good film needs a good story and 33 year old Sarah Polley steps up to the plate with this her second feature film not only as author of the original story, but as screenwriter and director. The name may not be well known, but this multi-talented individual captured the spotlight as an actress in the television series "Road to Avonlea". Her directorial debut was for the 2006 film Away From Her for which she also wrote the screenplay based on a short story by Alice Munro. Take This Waltz is a low-budget film, so low-budget I can't find a published number anywhere. On the other hand, The Avengers clocked in at $220 million. Do high budget numbers and special effects equate to box office mojo? The 2011 film The Green Lantern was deemed a disaster despite a budget of $200 million and now, one year later, has merely broken even. As odd as it seems, making a movie may be an art but it is also a business and if you can't make a profit, you're going to find it a tad difficult to find investors to support your "artistic endeavours" said in air quotes. I do hope the film "makes it", that is proves to be a financial success. Ms. Polley as an author, screenwriter and director is a talented person and merits more exposure. It will be interesting to watch where this talent goes in the future. This is a small film, a character study. You watch fascinated not necessarily by the action, but by the glance, the meaningful look, the quiet moment of reflection as the protagonists show us their inner struggles attempting to understand what's going on and to come to grips with it. Is it not what we all do? We may aspire to be larger than life, maybe even to be a superhero but at the end of the day, we are all just ordinary folks doing ordinary things and that's what this film is about: us ordinary people, living, loving, chasing our dreams and trying to come to grips with life. Sometimes it works, sometimes it doesn't. And when it doesn't, we move on. Take This Waltz is a 2011 Canadian comedy-drama film. The film centers around Margot, a 28 year old freelance writer who lives in a charming house on a leafy street in the Little Portugal section of Toronto, as she struggles with and examines her feelings for Lou, her husband of five years, while exploring a new relationship with Daniel, an artist and rickshaw driver who lives across the street. This is the second full length film directed by Sarah Polley. The cast includes Michelle Williams, Seth Rogen, Sarah Silverman, and Luke Kirby. Sarah Polley (born January 8, 1979) is a Canadian actress, singer, film director, and screenwriter. Polley first attained notice in her role as Sara Stanley in the Canadian television series, Road to Avonlea. She has also starred in such films as Exotica, The Sweet Hereafter, Guinevere, Go, The Weight of Water, My Life Without Me, The Adventures of Baron Munchausen, Dawn of the Dead, Splice, and Mr. Nobody. Polley made her feature film directorial debut with Away from Her, for which she won a Genie Award for Best Achievement in Direction and was nominated for an Academy Award for Best Adapted Screenplay. 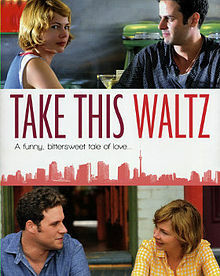 Polley's second film, Take This Waltz, premiered at the Toronto International Film Festival in 2011.